Click on the Hardware User Guide below for the access point that you have. The AP630 is a high-performance, dual-band concurrent access point with one 11ax 4x4 2.4 G and one 11ax 4x4 5 G radio. The AP650 is designed for indoor high-density environments that require HD video streaming and large file transfers. The AP650X has external antennas (sold separately), and an extended temperature range for industrial environments. The Aerohive AP250 features two Wi-Fi radios; a fixed 5 GHz 802.11ac Wave 2 radio and a software-selectable 802.11n 2.4 GHz/ 802.11ac 5 GHz radio. The AerohiveAP550 features 802,11ac Wave 2 dual 5 GHz radio, and 4x4:4/3 MU-MIMO . Built-in BLE provides proximity, indoor location tracking, and other location-based mobile engagement services. The compact, lightweight Aerohive AP150W can be mounted directly into a wall plate, or on a stand on a desktop. The AerohiveAP245X external-antenna AP features 802,11ac Wave 2 dual radio, 3x3:3 MU-MIMO with data rates up to 1.3 Gbps per radio using existing 802.3af PoE infrastructure. Atom AP30 is an 802.11ac wireless access point with plug-and-play installation. The AP122 features dual 2x2, 2-stream radios, providing dual 802.11n or 11n/ac performance with data rates up to 867 Mbps using existing 802.3af PoE infrastructure. The AP122X, with four detachable external antennas, is optimally suited for medium-capacity environments. The AP130 wireless access point provides dual concurrent 2.4 GHz 802.11b/g/n and 5 GHz 802.11a/n/ac radios for 2x2:2 MIMO (multiple input multiple output) antennas. The Aerohive AP230 has two radios that can operate in 802.11a/b/g/n/ac modes with optional Frame Burst support across all modes. The AP1130 is a multi-channel wireless access point with a watertight chassis that can be deployed in virtually any outdoor setting, including extreme environments. 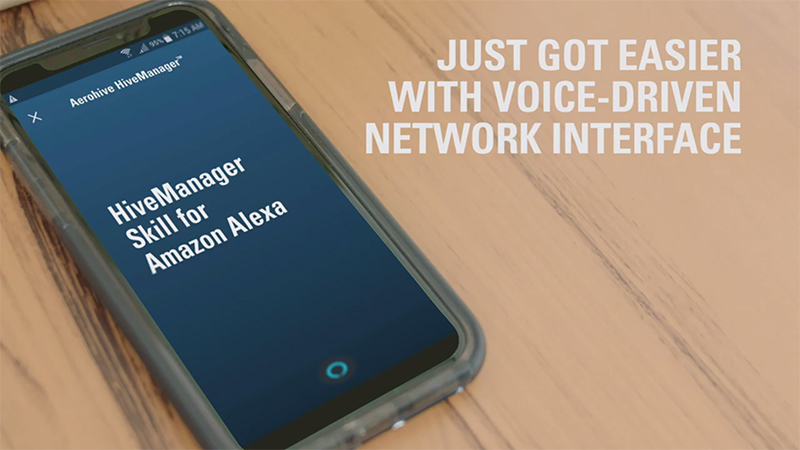 One of the aspects of IT management that HiveManager Shortcuts with Amazon Alexa integration simplifies is onboarding of new access points. Instead of manually typing in serial numbers of new access points, you can use an Alexa-enabled device to add it verbally. It’s quick and easy to add an access point to your HiveManager account, plug it up, and move on to the next one. You can even apply network policies with HiveManager Shortcuts! If you do not already have a HiveManager Account, click on the Register Now button below and fill out the form to register for an account. If you have already registered for a free trial account, click on the button below to take our products for a test drive and experience a new generation of cloud networking.